​Ken Bair, a maintenance services engineer in PennDOT District 3​, has shown his commitment to excellence after 17 years with the department, and through his countless hours of community service. Ken Bair, second from left, poses with his family, from left, Ainsley, Reid, Megan, and Jake. Bair was instrumental in modernizing district maintenance operations by regionalizing seal coat and paving crews. Previously, each of the district's nine (Bradford, Columbia, Lycoming, Montour, Northumberland, Snyder, Sullivan, Tioga, and Union) counties would complete its own program. By regionalizing the process, the department has increased production and quality, while freeing existing county staff to perform other maintenance activities. Quiet and modest on the job, Bair's actions at home in Mifflinburg, Union County, and in his community speak volumes about the kind of person he is. Faith and family are his top priorities. He coaches youth football, baseball, and basketball, and serves as a youth leader at his church. "I enjoy working with kids," he said, "helping them with their problems and teaching them about my faith." He and his wife, Megan, attend Harvest Bible Chapel of Union County. They have three children: daughter Ainsley, 15, and sons Jake, 13 and Reid, 10. Reid was adopted from Bulgaria when he was 2 years old. Ken and Megan are in the process of adopting another child. 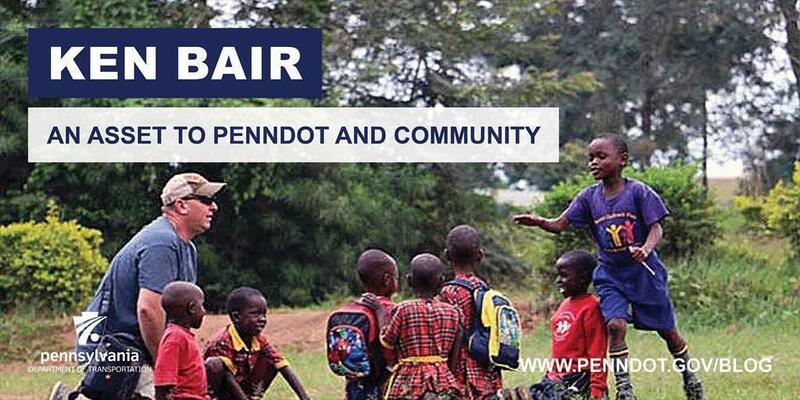 Outside of work at PennDOT, Ken Bair coaches youth sports, including football. Bair also recently spent two weeks in Kyampisis, Uganda, with a group of adults and teenagers from his church, assisting with a youth retreat.